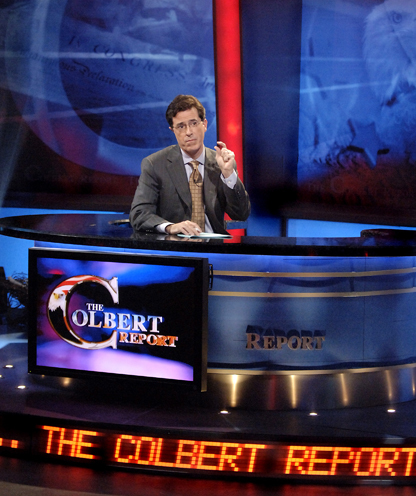 This study investigated biased message processing of political satire in The Colbert Report and the influence of political ideology on perceptions of Stephen Colbert. Results indicate that political ideology influences biased processing of ambiguous political messages and source in late-night comedy. Using data from an experiment (N = 332), we found that individual-level political ideology significantly predicted perceptions of Colbert’s political ideology. Additionally, there was no significant difference between the groups in thinking Colbert was funny, but conservatives were more likely to report that Colbert only pretends to be joking and genuinely meant what he said while liberals were more likely to report that Colbert used satire and was not serious when offering political statements. Conservatism also significantly predicted perceptions that Colbert disliked liberalism. Finally, a post hoc analysis revealed that perceptions of Colbert’s political opinions fully mediated the relationship between political ideology and individual-level opinion. Ever wonder how online sites like Buy.com are able to sell merchandise for a few dollars less than other sites? It looks like Buy.com has a simple formula to make money. From complaints I’ve seen about this company it appears they make money by failing to give refunds for returned products and sometimes charging for products which are never shipped. After my experience with them I find all these on line complaints credible. I returned a defective item to them. (I have two other units of the same item so there is no doubt that the one was not functioning.) Their web sites states their policy is to refund the full purchase price for defective items along with shipping both ways. They have not honored this policy. In contrast, last month I had some questions regarding a purchase received through one of those small independent sellers that sells through Amazon. Amazon’s site had a link to send a message to the seller. The seller quickly responded and the problem was solved. At least the internet does give some small satisfaction out of the hope that posting things like this on line will wind up costing crooked companies like Buy.com more than they ripped me off for. Last year I had another post on a crooked online dealer. I mentioned at the time that I wound up canceling an order and ordering an item from Newegg, knowing that they were reputable, even if charging a few dollars more. I intended to do a follow up but in the heat of the election year never got around to it. The camera received worked fine but while on vacation I found that one of the SD cards I also ordered was defective. I emailed Newegg’s customer service while on vacation, mentioning I found this while traveling. They said that since I was traveling I didn’t even need to return the defective item and they quickly shipped out a replacement. It certainly is worthwhile (and in the long run more economical) to deal with more reputable companies on line as opposed to going with the ones which charge slightly less by taking shortcuts. Update: I found yet another site with lots of negative reviews of Buy.com. This one is convenient as multiple reviews can be found from a single page.